The 5DT Head Mounted Display (HMD) offers the user affordable quality, high resolution (SVGA), a crisp image and superior sound quality packaged in a sleek, comfortable and extremely light headmount design. 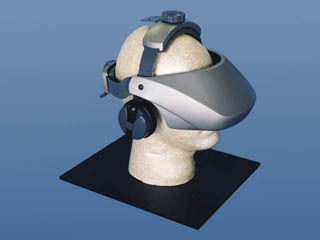 The HMD provides for user configurable immersion levels. Other features are adjustable top/back ratchets, a mounting base for head trackers and a flip-up mode for reality checks. SVGA, PAL and NTSC input signals are accepted.